Gently rolling, moderately wooded course in an awesome park. Some densely wooded holes and a few open holes, but all have some obstacles. Baskets #1 and #9 are visible to the north of the parking lot and #10 and #18 are visible to the south. The original Red Fox 9 hole course is to the east. From I-94; Hwy 50 west 8.4 miles to a left at 256th Ave/Silver Lake Rd. Follow Silver Lake Rd. 1.8 miles. It turns slightly right and becomes 85th Pl/93rd St/Co Rd F. Go 2.4 miles to a left just before Hwy W.
Excellent use of terrain and foliage for changing challenges. It is a very clean course and well maintained. 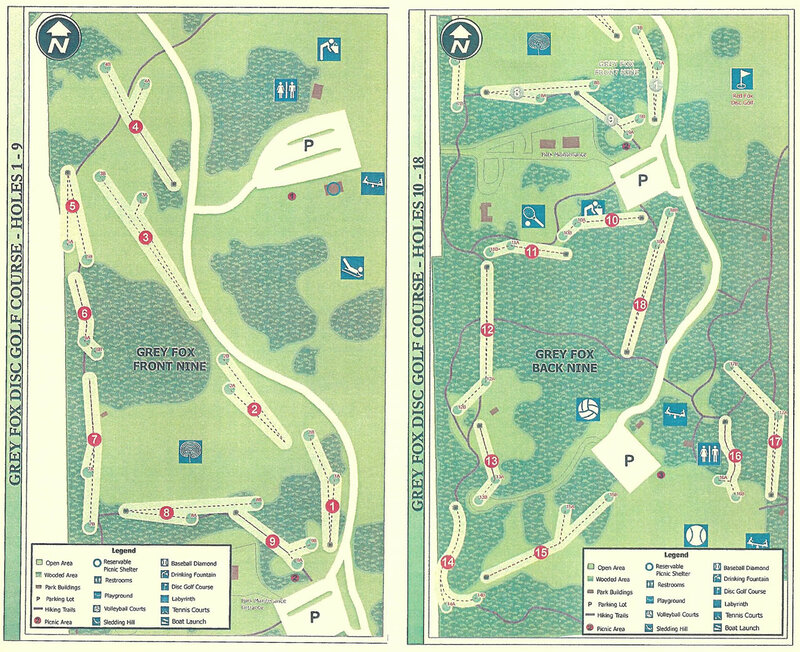 *I suggest if you are going for the first time, grab a scorecard at the beginning of each 9 holes; you may need the map to assist you in finding a few of the tees. wife and I just started playing. course is close to home. Nicely maintained even this time of year. has good variety from wide open to tight holes and some nice elevation changes. Has a short 9 hole course for warm up and short game practice. Very enjoyable setting.Is alittle muddy in spots, so if your out now wear hiking shoes. The nicest course I have played on ... but it was also the first course I ever played on. The course is very well maintained and it seems like they add something new every week. It has: concrete tee pads, they just added a map with distance at each tee, 2 locations for the baskets on each hole which they move every few weeks (maybe they will eventually have 2 baskets on each hole), wood chips on the trails and picnic tables at most of the tees. I have never seen any standing water on the course but you will need bug spray. It has a lot of tight areas but there are also some open areas on the front 9. It also has has a lot of rolling hills that you are playing on. A fun and very nice course. Course is very hard on some holes, but very easy on others. Nice mix of holes, however it is mostly short or tight, and does not allow for many long drive shots. The maintenance of the park is great. You can warm up on the short red fox 9 holes, than play the 18 hole Grey fox course. Bring bug spray. No footage on tees but score cards at each nine with footage. Best curse in the area.Check out discguys store just east of the park.address is not correct, might be Kenosha county headquarters, park is in Silver Lake, Wi.